Here is another great release from this fresh new netlabel. Filled with 15 very different tracks from an array of independent artists, “Winter Tales” has a track for everyone. 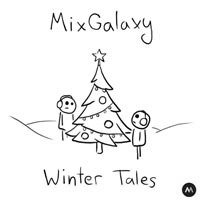 This winter Mixgalaxy Records prepared for you this very special compilation full of mystery and fairy-tale spirit with snowy scent of cold winter nights spiced with catchy melodies and grand arrangements. Our “Winter Tales” will give you a magic atmosphere, filling any place they’re being played at with viscous drones of ambient, sombre idm beats and soft chillout with folk-pop touched by traditional Russian music, making it suitable for nearly any situation whether it’s being a Christmas holiday party or just a steady evening spent alone. The compilation explores each possible human emotion associated with this chill season being supported on this side by some guest appearances featuring project Sinestesia which hardly requires any detailed introduction to Russian electronic music arena since they have performed on numerous EDM festivals and been around for quite a while now. Once again the artwork was produced by Gerdes who already became some sort of our staff artist since his simple pencil-drawn covers gradually help forming the face of the label. In addition, Gerdes also contributed his track Astel to “Winter Tales” and made his musical debut on our label. Few regulars appear alongside of new artists and new sounds, so let yourself be carried away by this rich and highly enjoyable music flow. Dive in! This work is licensed under a Creative Commons Attribution-Noncommercial-No Derivative Works 3.0 Unported License and it’s available from the MixGalaxy’s Website.